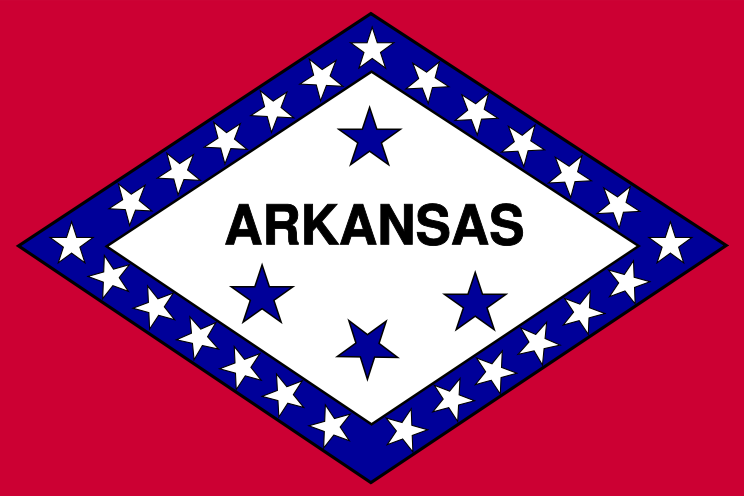 The 25th state to join the union on June 15, 1836, Arkansas slogan as 'The Natural State' is well earned. The Ozark Plateau in the north and the Ouachita Mountains to the south are home to lush forests, abundant wildlife and many caves. Its hot water springs are world-famous. Fertile plains comprise the areas of southern and eastern Arkansas and are known as the Grand Prairie and the Delta, respectively. During the Civil War period, Arkansas was reluctant to secede and only did so once federal troops were sent to South Carolina. 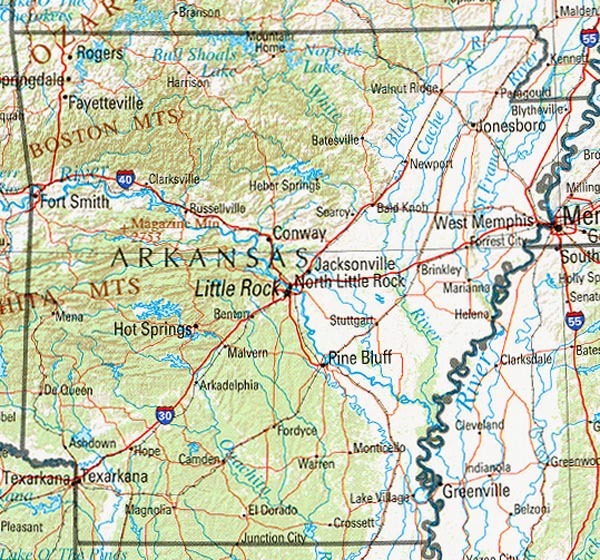 Arkansas was probably named by early French explorers for the Quapaw people who lived along the Mississippi, which forms its eastern border; Arkansas means 'down river' or 'south wind'. To solve a dispute over the pronunciation of its name, state legislators signed into a law a bill officially declaring that the state be called 'ar-kan-saw' and not 'ar-kansas' in 1881. Arkansas is the home to the corporate headquarters of industry giants Wal-Mart, Tyson Foods, and JB Hunt. The impact of these and other multinational corporations on the state has led to a perceived economic boom, though Arkansas still has the 49th GSP per capita, the 49th per capita income, and the 5th highest percent of people below the poverty line. Unemployment rates, however, are below that of neighboring states. The African-American population in Arkansas is around 15.7%, the majority of which residing in the southern and eastern parts of the state. Arkansas has the 4th most powerful Democratic Legislature in the nation and has only sent one Republican to the U.S. Senate since Reconstruction. The Democratic Party holds super-majority status in the Arkansas General Assembly and Republicans lost seats in the State House race of 2004. While this is unusual in the modern South, the state is still considered conservative and in 2004 it granted its 3 electoral votes to George W. Bush with 54.3 percent of the vote.